You can grow it, shuck it, pop it, cook it and for years... even play in it. With all the different uses, corn may be the world's most widely used crop. During this time of year it's popularity seems to be less about eating and more about getting lost in it. I for one really dont see the fun in corn mazes, still this is the 3rd straight year we have gone to Cornbelly's. But this year was extra fun because Ted was able to come with us. We all had a great time. Some of the things that are at the festival besides the corn maze are, the Haunted Creature which Daesha cried for the first time but wanted to go again as we were leaving. So Ted took her through again. 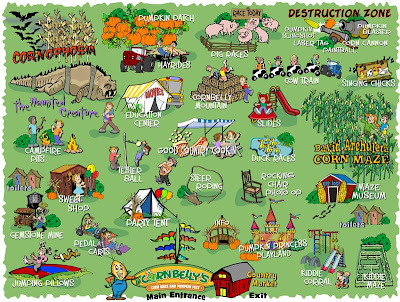 Also a Cornophobia haunted maze trail, Spooktacular Jack-o-Lantern hayride, jumping pillow, trick-or-treating trail, pick-your-own pumpkin patch, pig races, cow train rides, pumpkin blasters, a gemstone mining operation, and much more. This year they added the Pumpkin Princess Playland that Daesha loved. There was a real cinderella carriage that was brought to Utah straight from New York City, it's the same carriage used at the movie premier of Disney’s Cinderella movie release in 2005! At the pig races Daesha and 3 other kids were picked to help each sections pig win. The kids didn't do anything but cheer with the rest of us and then she got a plastic spider ring for going up front to cheer. It was a fun evening and we can't wait till next year. Daesha going to the princess dress up area. Love the hair she chose..hmm might have to find some yarn that color for her next hair style. I love the face Keegan is giving this boy. Keegan doesn't care that the other boy is twice his size he had better get out of his way! Daesha and Ted racing the rubber duckies. While pumping water up the pump and down the pipes. Ted helping Daesha rope the steer. First she roped herself, then Ted, then she gave up. Daesha talking with the pig farmer before the pig race. Our pig came in last. too bad this parking spot was taken when we got there. But I still thought it was silly and wanted a picture with it. Nice Legs Chandra!! You guys do so many fun things. Your kids are getting so big and to answer your question yes I miss Janice...NOT!! We need to go to CornBelly's this year. We went two years ago and Savannah loved it! I love Fall!! You take such pictures of your family excursions! Looks like you guys had a blast. Daesha is darling playing dress up.